I have to admit that even though I'd rather be inside, I have been trying extra hard to get my boys outside every day at least once. I mean it is summer, and there is something about playing in the sun that lends itself to nice naptimes and easy bedtimes! Of course, it is inevitable that rain will prevent a daily trip outside after a while... So what is a determined mom to do? Search Pinterest for some extra ideas! Weeks ago I stumbled upon a great simple activity from I Can Teach My Child. 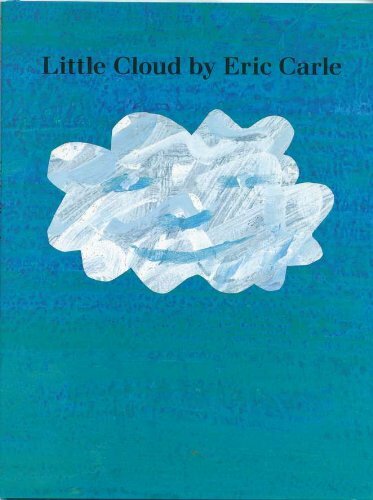 Jenae had a wonderful painting activity based on Eric Carle's book Little Cloud. And a rainy day seemed perfect to pull this one out. So we curled up on the couch and read the book. It is a great simple story, that is engaging for little toddlers, and yet provides great points to discuss for preschoolers. And I don't need to mention the gorgeous art work that Carle is known for. After we had finished reading the book, we got to paint our own little clouds. My boys loved it. This activity is fun because the paint is actually shaving cream and glue (I added a small dollop of white paint because our shaving cream was that blue gel...). As I stirred the concoction, it of course puffed up which allowed for some nice textured clouds. I was very pleased at how much time my boys wanted to spend painting clouds. Of course the final product always looked like a huge white smudge, but the process was great fun. Plus the whole time they painted we discussed clouds, and how they bring rain, what the rain does, who is in charge of bringing the rain. The conversations were great. Thanks Janae for the great book inspired craft for a rainy summer day! Here's my affiliate link for this wonderful book - if you are interested in it at all, I'd love for you to order through my link and support Reading List.